By providing concentric, eccentric and stabilization challenges, nothing pushes the body quite the way weights do. Our physical therapy weights and accessories provide the resistance patience need to help rebuild muscles after an injury. From cuff weights to dumbbells, we have a wide selection of weight styles. Cuff weights fit snugly on the ankle, the wrist, or even the thigh. Secure and comfortable, these weights can be utilized in the clinic or at home. 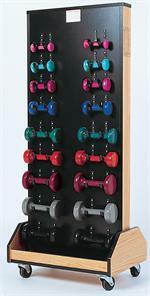 Color-coded dumbbells are also a favorite for a range of motion exercises and strength training techniques. 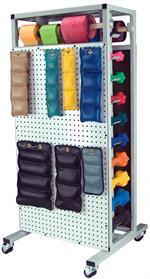 Keeping your weights organized is easy with one of our weight rack units. These storage racks will hold both dumbbells and cuff weights while conserving valuable space in your rehabilitation center. For added versatility and convenience, our weight racks include casters. For functional and cost effective exercise solutions, order your physical therapy weights and accessories from e-current.com today.